Ah. Sharing. One of the most popular and most debated issues facing parents of toddlers and preschoolers. And one of the most common challenges I get asked to address. But before I explain, let me say that I completely get it that the great majority of us want our kids to “be nice” and to play well with others. We want to have the child at the park who hands another child a shovel, smiling all the while, and proceeds to happily dig together, side by side. We want our children to have “manners.” Perhaps more than anything, we don’t want other parents to scowl at us, judge us, shake their heads, say “tsk tsk”, or glance at another parent in a way that we are certain means that-parent-is-doing-a-terrible-job-and-is-creating-a-spoiled-brat. We all know the feeling, and no one can blame us for not wanting to be the recipient of scorn. It’s not a myth because children don’t ever share, or shouldn’t share, or because manners aren’t important. It’s a myth because: the things that we expect them to do that we call sharing are not sharing, and because of the nature of cognitive development in young children. Think about it. When you sit down at a restaurant with a beloved relative, and you say you’re thinking about ordering a gorgeous creme brulee for dessert, and your relative says “Are you interested in sharing?”, they don’t mean “Do you want to order the creme brulee and I’ll eat it.” They mean “Do you want to order the creme brulee and we’ll each eat approximately half?” That’s sharing. Ordering dessert and giving it to them is NOT sharing. It’s giving it to them. You don’t get to eat any. Even the most naive of adults can figure out that that’s not what sharing is about. And we’re adults, with adult abilities for understanding. We’re talking about toddlers here. I’m absolutely certain that there are parents who are reading this and saying to themselves (or to me): “Bull. My kids share. I have told them to share since they were little and they do it now without being asked. It’s not a myth.” To those parents, let me say “I believe you.” Young children can be taught to do many things that they do not come by naturally by the use of reminders, reinforcement, punishments, warnings, tone of voice, etc. I mean it, I believe you. I would argue that what your children are doing is giving up toys in response to a limit that you have set. They are following a limit, obeying a rule, doing something that is expected of them. None of those things fall within the definition of “sharing.” To go back to the creme brulee example for a moment: that involved a question (“are you interested in sharing?”), to which there was an option of a freely chosen answer, which might be “Sure!” or “I’ve heard they’re smallish, maybe we should each get our own” or even “I think I’m getting a bit of a cold, so it might not be a great idea to share.” (clever, that last one.) Perhaps it goes without saying, but having a truck and giving another child the truck when they tug on it, point to it, or want it because that’s what your parent wants or because you’ll get in trouble if you don’t bears no resemblance whatsoever to this example. See anything about giving something up and letting someone else have it in there? No, me neither. Okay, fine, I can hear some of you saying. 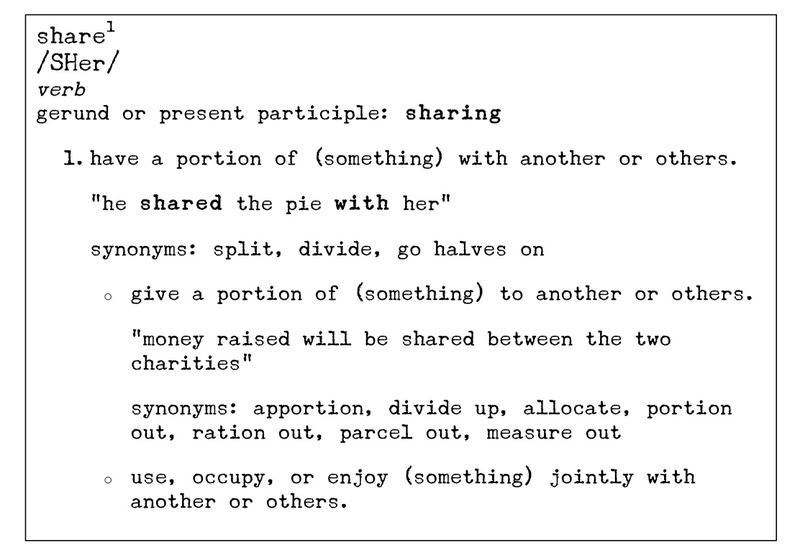 Fine, so what I want my kids to do doesn’t fit the dictionary definition of sharing. I don’t really care. I want them to be nice and generous and be the kid at the park who gives another kid a shovel and I still don’t want parents looking at me in that judgmental way. Fair enough. So let’s dispense with the creme brulee example, and focus on what you really want your child to do, whether it meets the definition of “sharing” or not (though if that’s the case, then in the interest of their developing language, it might be better to do away with the “please share” or “share your truck with the little boy” stuff.) It seems we need a new analogy. You’ve just moved to a new town, and taken a new job. You’ve finished moving into and decorating your new home, and you’ve carefully placed all the lovely mementos that friends and relatives gave you as housewarming and going-away gifts before you moved. You’re having your first dinner party. A couple of people from the new job, a couple of neighbors, a couple with kids your child’s age. It’s all going beautifully. One of your guests admires the “Home Is Where The Heart Is” wall hanging that your mother gave you before you moved away and that you have hanging in your dining room. She says she would love to have one like that. I’m pretty sure you know where I’m going with this. You have something. A relative stranger wants it. By the definition of “sharing” that you want your two-year old to exhibit, you need to go over, take it down off the wall, and give her the wall hanging. Are you still sure this is exactly what you want your children to learn? Now I’ll give you, there actually are some cultures that do just that, that hold that as a value. When someone admires something that you have, you are supposed to give it to them. My guess is that most of you don’t come from such a culture. In my view, this brings us to a bit of a hurdle. You can’t give someone half of a truck. Or half of a shovel. Or half of a ball. You can only give it up. And that’s not quite what you want to teach them. Now what? Let’s take a look at what you want. You want your children to be generous, to be kind, to play cooperatively and in a friendly way with other children, and frankly, maybe even for them (and by association, you) to be admired (and maybe even envied) by other parents. The question is, how do children develop those traits? Or maybe I’ve got it all wrong, and what you really want is for your children to obey, and to give something up when you tell them to, because you told them to. You are entitled to want that. I’m not the right person to talk to about that, because, well, I don’t believe in it. So, with your permission, we’re going to stick to the subject at hand–sharing–and move ahead assuming (and pretending, if necessary) that obedience and sacrifice are not what you want for your two or three-year old. You with me? Excellent. The answer is that toddlers (and infants) learn generosity and kindness by people that they trust being generous and kind to them. You cannot teach someone generosity by demanding it. You cannot teach someone to be kind by telling them to be kind. You can only teach generosity by being generous. You can only teach kindness by being kind. There. I said it three ways. That should get the point across. Yes. It’s really true. The answer is also that toddlers don’t generally play with others. Most children under three engage mostly in either solitary play or what is called “parallel play,” in which they are playing near or beside other children, but not with them. It’s completely normal, it’s a well known stage in the development of play. It’s what they’re supposed to be doing. During the preschool years–at different ages for different children–they do begin to transition from parallel play to associative play to cooperative play…but again, they figure that out in their own way and time, and they often will go back and forth from parallel to associative play to parallel play again. 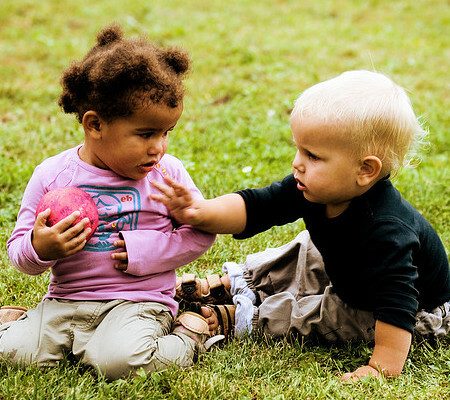 Most children don’t truly engage in cooperative play until they are four or five. And the answer in relation to cognitive/brain development is that children under five are egocentric (which we tend to see as a synonym for “selfish”.) We may not always like it, but it’s who they are. It’s how preschool brains are wired. It is not that they don’t care about others–they likely do care a great deal about others, especially if they have been treated with empathy. But they are genuinely, physiologically, neurologically incapable of seeing something from another person’s perspective. This is why it isn’t effective to say to preschoolers “how would you feel if they did that to you?” or “how do you think that makes her feel?” when they hurt someone or say something mean. They will give an answer, because they know the right answer. They’ll say “bad” or “sad,” because they know it’s the right answer. But cognitively, it really doesn’t make sense to them. They can’t put themselves in someone else’s shoes. It’s a brain thing. It shifts between 5 and 7. Before that, nope. So, your worry about having the toddler at the park that’s selfish? They’re ALL selfish. Wait, so, I just have to let them be selfish? Yes and no. Young children are selfish, egocentric, self-centered–like I said, it’s a cognitive developmental thing. It’s okay. They’re doing exactly what they’re supposed to be doing. So, what CAN you do? What DO you do? Take heart, not all is lost. Although young children cannot genuinely “share”, there are things they can do. Toddlers can (believe it or not) work it out themselves. Yes, really. You might be surprised. Sometimes they can tug and tug on a truck and even cry a bit and then solve the problem themselves. Sometimes they protest a bit, pulling a toy away, and then two seconds later, without our intervention, hand it to the other child. This is the best of all worlds. They are learning to negotiate their own social world, building skills in their own way and time, and we are present as support, just to make sure that no one gets physically hurt in the process. You could learn to sportscast, which can be extraordinarily helpful to toddlers as they negotiate conflicts and struggles. You can empathize, and comfort the child who is upset that they didn’t get the toy (also a valuable lesson..things don’t always go our way in life, and it’s okay to be upset and move through it when that happens). You can observe and see what sort of situations are particularly challenging for your child, or what toys they favor. There are so many good opportunities with toddlers. Preschoolers who are about 2 1/2 or 3 and up can learn to take turns, though it’s not necessary. That’s the compromise between giving up and sharing something that cannot be divided. This does NOT mean saying to your child “Let her have a turn.” That’s really no different from telling her to share and give up what she has. This is something you tell your child when they are the one who wants something, and maybe (if you’re brave) what you tell the other child that is trying to take something from your child (presuming your child is vigorously objecting, otherwise you can let them work it out, as discussed above). “When they’re done, you can have a turn.” (to your child) “When she’s done, you can have a turn.” (to another child) “Would you like a turn when they are done?” (to either child). In about 90% of the cases, children under 3 or 4 will have forgotten and moved on to something else by the time the child is done (ideally as defined by the child, not by you), and it won’t even be relevant anymore (see letting them work it out on their own). Sometimes they will wait patiently. Sometimes they will ask if the child is done. All of these are ok. Sometimes–and this can happen a lot with younger preschoolers–the child will hand over the toy a few seconds after they are given the opportunity to keep it until they are done (they’re so brilliant at this stuff.) I think of it a little bit like the poker scene in Butch Cassidy and the Sundance Kid: “If he invites us to stay, then we’ll go”. They want to feel in control–and that’s often ALL they want–and the toy is secondary (often by a long shot). For those that are wondering, I very rarely use the “you can have it for five minutes and then it’s their turn.” I save that for extreme circumstances of children who play together all the time (siblings, daily peers in a child care setting) and even then, for dynamics which have settled into a stagnant pattern in which one particular child is persistently hoarding or, alternatively, frequently being kept from playing with toys. In such a situation, I might intervene by setting a limit based on a time period (which they don’t really understand, either, as preschoolers aren’t capable of genuine temporal reasoning.) But it’s a rare choice, mostly because I trust that children can figure it out without an adult imposing a structure of that adult’s making. Now, before we close, let’s go back to the park, with the shovels and the trucks and the other parents and our longing. Imagine how your life, and your child’s life, would be different if you didn’t feel the pressure to remind your child to share all the time. Imagine how your life and your child’s life would be if you could trust in the natural unfolding of development and simply model the traits you wish for your child to manifest. Imagine watching your toddler solve struggles over toys for herself, and the implications that that has for later, more sophisticated struggles. Imagine the enriched relationship that arises out of a child feeling that a parent trusts them to make good decisions and handle difficult situations. Let development unfold. Try your very best to take the word “share” out of your vocabulary for now–it doesn’t hold meaning at this stage of life. Trust in your child and her path. The rewards are far greater than any pride you could possibly feel at having the “nicest toddler at the park.” I promise. This entry was posted in Uncategorized and tagged development, discipline, egocentrism, manners, myth, selfishness, sharing, toddlers. Bookmark the permalink.